I wanted Samantha when I was younger. They didn't have many to choose from then. I didn't get her until my mom started my own girls' collections of American girl dolls a few years ago. We now have Samantha, Kiersten, Felicty, and Kaya. Plus, my older daugher has a My American girl doll and my youngest has a bitty baby. I totally wanted the Samantha doll with her red Christmas dress. I thought she was the most awesome character. I never had a doll, but I drooled over the magazines we got every month. I had zero interest in the dolls, but I enjoyed the books. I read all of Molly, Kirsten, and Samantha. Molly was my favorite girl, and my favorite book was the one when she went to summer camp. When I started reading the books, Felicity and Addy hadn't appeared yet. I think there's a bunch more girls now. My sis had a Samantha doll with some accessories. I remember my parents mentioning how expensive it was, and that she "take very very good care of it". Where on earth is her analysis of Kit? Kit was my absolute favorite! I had Samantha because I loved anything Victorian when I was in 3rd/4th grade. (A Little Princess? Anne of Green Gables? The Wolves of Wiloughby Chase? Yes please!) Now I love anything steampunk. Thanks, Samantha? Also, I actually worked at an American Girl store for a summer. I loved when a little girl came in and was so serious about picking out the "right" doll (even though they all looked the same) because she'd been saving her money for a while and wanted to make sure she got the exact right one. Way to go, girls. I was a Felicity girl, but the article seemed a little snarky toward Felicity, didn't it? Maybe that's just my teensy hint of self-righteousness speaking. ;) But I must say, "a latent familiarity with Colonial Williamsburg" is spot on. "You grew up to be financially independent, level-headed, unspoiled, and still just a little bit resentful whenever you walk by American Girl Place." @Page--I'm glad to hear the American Girl tradition lives on! @Titania86--I'll be honest, sometimes my first graders bring in the magazines, and I kind of still drool over them. Liz--Kit seems like a really cool doll! She appeared a little later, I think--I definitely remember being past the age of being interested in dolls when she came around. Annie--Oh my gosh, I loved the Wolves of Willoughby Chase! I remember reading it in 4th or 5th grade--it was my first experience at "critical analysis" of a text. I was too old for this phenomenon but totally intrigued. The books were a hit in my classroom! 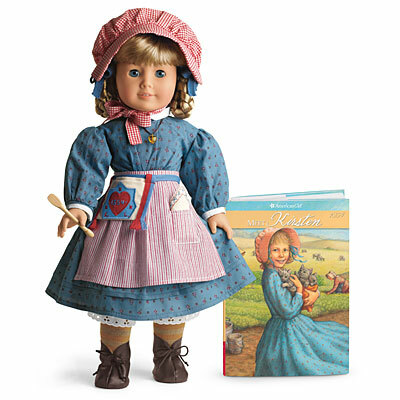 My first doll was a Girl of Today that my mom customized with Kirsten's clothes to be Laura Ingalls Wilder of Little House on the Prairie. She was sooooo awesome. Now I have fourteen dolls in my collection, and my favorite is Felicity. The description actually pictures me pretty well.